Why Should Upholstered Furniture Be Professionally Cleaned? 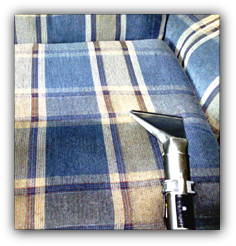 Every now and then, you may notice a spot on your upholstery and clean it yourself using a store bought household upholstery cleaner, right? It’s quick, it’s easy and most of the time, it’s pretty effective to remove the occasional unsightly spots on your furniture. But what happens when it becomes obvious that the problem is more than just a spot or two and the entire piece of furniture needs a thorough cleaning? It may be time to invest in a bit more than a cloth and spot cleaner. Also, just because you can’t see any visible sports or stains, does that really mean your upholstered furniture is really clean? Probably not. At EcoClean Dry Carpet Cleaning, we understand the importance of clean upholstery and use the industry’s best technology to ensure you’re thrilled with the results. Our certified professional technicians utilize equipment that cleans virtually every type of upholstery in existence, including Jacquard, velvet and Haitian cotton. Before beginning any upholstery cleaning process, our we inspect each piece of furniture to determine the appropriate cleaning method. Once a proper furniture cleaning method is determined based on the make and material, we get to work removing stains, restoring color and reviving your upholstery. We also offer a deodorizer service, as well as our FabricGuard stain- resistant protective finish. Our upholstery cleaning is 100% Guaranteed – exactly like all our other services!